I read an article the other day entitled ‘The Thing More Couples Fight About Than Anything Else’ or some such, and I clicked through expecting to see some of the top suspects peering back at me. I thought I’d see a little financial tiff, or perhaps a chore eruption, or maybe even a differing opinion on parenting, but you know what life changing event this article was referring to? Many of you, i.e. those not about to renovate their bathroom in T minus 7 days, would probably have skimmed the piece of trash article and gone on your merry way, but being as I’m in the ‘other’ category I thought I’d have a little read, accept it as gospel, and freak myself out for the impending ablution room face lift. I imagine if we had been stealing happy moments comparing tiles and taps, catching glimpses of ourselves in showroom mirrors laughing gaily at each other and having sneaky public bum squeezes, the article wouldn’t have resonated worth a damn, but being as the cracks have already started to show before we even buy a tile then I’m inclined to wonder if perhaps said article holds a touch of merit. Alas, I’ve decided I must disregard this journalistic trash and forge ahead with the tunnel visioned view of my sparkly new bathroom. We are stronger than renovations. If we can do toddlers, and triathlons, we can handle a bit of wall rendering and plumbing, right? I got myself a bit low over the whole business and really wanted to eat large amounts of cake to settle my nerves. I’ve always been more carrot than chocolate when it comes to cake, but I also didn’t want to undo ALL the good work I’ve been doing at the gym. 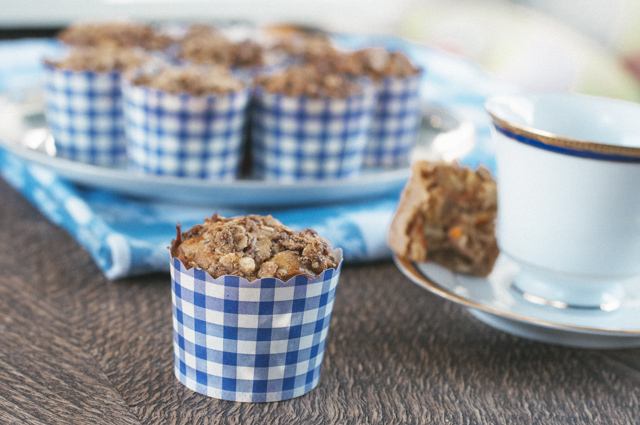 These muffins are possibly the best muffins ever I’ve not only made, but eaten. I was trying to harness apple, carrot and ginger goodness, but kept fantasising about crumble tops and then these were born. Not too naughty, not too difficult and in my tummy in under an hour….. all four of them. Woops. Preheat oven to 180C, and line your muffin tray with patty cases. 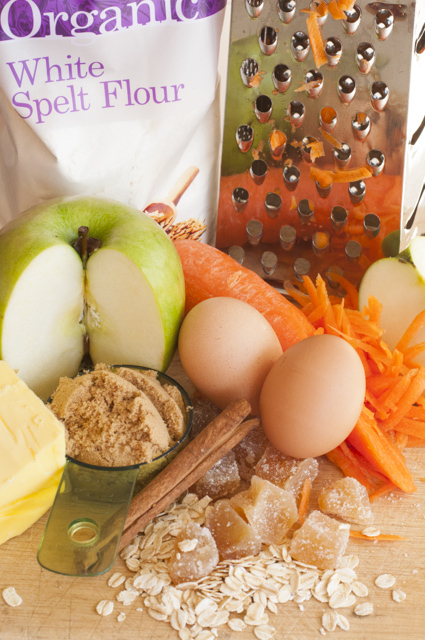 Put all dry ingredients into a bowl and mix to combine, add fruit, carrot and ginger and stir through. Add your wet ingredients. Mix well and spoon into your muffin cases in your tray. 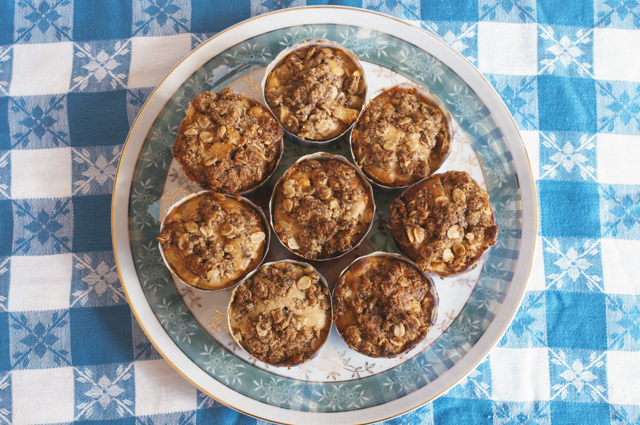 For topping, rub all together to create a crumbly texture and sprinkle on top of each muffin. Bake for about 20 mins or until a skewer comes out clean. OMG, nom nom nom. Eat while warm. Seriously. Then eat the rest cold. I hand over all executive power to Dadabs when it comes to anything construction related. He pays the entire cost and does all the work. WIN-WIN. Does that include design, Mumabs?? I’ve been handed 90%. Says he doesn’t care, until suddenly, he does!! Oh yes. I want to offer words of encouragement, but I doubt we’d survive a reno. Was packing and driving to a holiday on that list??? Should be!! It’s infuriating how you pack and organize the entire family while he packs a little bag for himself!!! The Koala and I never fight. I know, it’s weird. But we keep our finances completely separate and we haven’t renovated or had kids. I like to think that if we had to fight we could do it, but we’re not fighty people. I would love to renovate a house one day though. With a decent budget. Never? Wow. We don’t fight often. We’re more ‘have a serious talk’ people. It’s often about finances and time. Two very boring subjects! We’re liberal jellyfish. We let each other figure out our own finances and time. Renovations is the thing? Who knew that many couples were even renovating? Maybe we should put in the marriage vows in sickness, health and renovations? We are supposed to be renovating, but neither the husband or I could really be bothered. Stuff is starting to fall down around us, though, so we’d really better get our boxing gloves on and our arses into gear… Stay tuned! I hear you on renovations and the ‘tiffs’ , enough said we made it through our renovations and I got most if what I wanted with a few compromises. 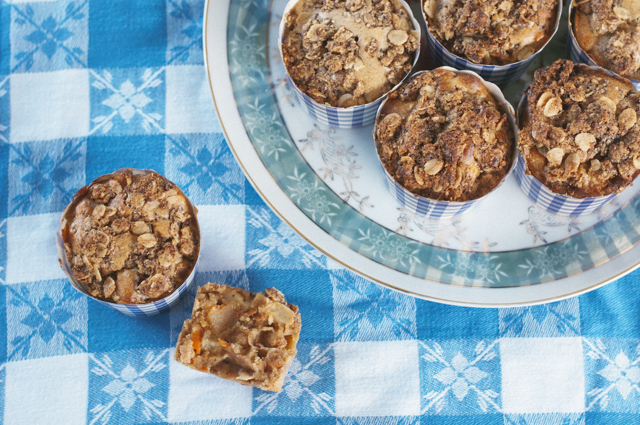 Now I am fantasising about making those muffs with crumble topping …today. Do I need the ginger ? No, not at all, I just love that sweet, chewy burst. If you like ginger but don’t have candied ginger in the house, you could add a little finely grated fresh ginger, or 1/2 teaspoon ground ginger, but if you don’t dig it just leave it out. Pleased you made it through renos. We’re one week down, two to go! Best muffins ever! So good in fact, that my 14 month old who has up to this point refused cake of any kind (no daughter of mine that’s for sure…) polished one off and then grunted for another. I have made a lot of your recipes and they have all been excellent but this is the best so far! Thanks so much!! You just made my day. Officially. Hi, these look delicious but what do you mean by 2 tbs LSA in the crumble recipe? Hi Heather, it’s ground linseed, sunflower and almond mix. I can buy it at my supermarket. It’s delish. I throw it on cereal and in muffins and pancakes as it’s a high source of omega 3.